For those who want to make greeting cards, copies of art work, or any number of creative projects that require duplication, there are many copy and printing stores in THE BEE's readership area that make it possible. Customers are not always certain just what is available and are looking for ideas, so what follows is an overview. A Garthwick neighborhood resident, Rosemary Ellis, had a lot of fun creating Holiday gift placements by pressing colorful fall leaves and laminating them at the FedEx Office Print and Ship Center in Westmoreland at 1528 S.E. Bybee, across from the Sellwood-Westmoreland Post Office. Rosemary and her husband Walt care every day for their great-granddaughter Lila, and love walking in the neighborhood in all seasons, admiring plants and trees. "We are teaching Lila to be very aware of nature," reported Rosemary, "and this fall we three picked up leaves for many weeks. They became brighter and more beautiful as the weeks passed. "The young man who was working there [at the FedEx Store] was very helpful and didn't rush us. I did the layout and Walt laminated them [the 12"x18" placemats]. It was a very positive experience." To contact the FedEx Store call 503/231-0495. At the UPS Store in Woodstock at S.E. 42nd Avenue and Woodstock Boulevard, the printing workshop is newly expanded, now including the space of the former Pacesetter Shoe Store. About a year ago the wall between Pacesetter and the UPS Store was knocked out and gradually new machines were installed, including a wide-format printer that does Giclee printing that has made it possible to produce archival reproductions of a customer's fine art and photography. Finished Giclee prints can be a little over a meter wide, very detailed and printed on high quality archival papers. Giclee (pronounced Gee'clay) is a French word meaning to spray or squirt, which is what an inkjet printer does. The key to most print creations there on Woodstock is "Print Wizard" Terill Ketcham, who has worked at the store for five years. "I got that title because customers were often saying that I was a magician or wizard when I helped them create something," explains Ketcham. Barbara Criqui, a Sellwood resident, says Ketcham has helped her with many family projects including a birthday card for her mother's 100th birthday, notecards for her granddaughter, typing of her handwritten memoirs, and a bound book of family history photos. "We have seen a lot of growth during the past five years that I have worked here," says Ketcham. "No matter what the project, I can do it!" That growth includes making cards of all kinds, prints, digital copies for websites, envelopes, event programs, fliers, booklets, posters, banners, signs and design of logos. Many jobs can be done while the customer waits. To contact the Woodstock store call 503/788-1400. The Sellwood-Westmoreland UPS Store at 1327 S.E. Tacoma also specializes in creative printing in addition to shredding, laminating, notary, banners, fliers and spiral binding, which most UPS Stores do. Rachel Ginocchio, a Sellwood resident, has used the Tacoma UPS Store extensively for the personal, professional, and community work that she does. "I adore working with the owners of the Tacoma store," she says. "Afshan and Nabil pay acute attention to details, and are hardworking, kind, warm, and welcoming. They will take on any project, big or small, and get a kick out of challenging projects." To contact the Sellwood store call 503/235-7122. 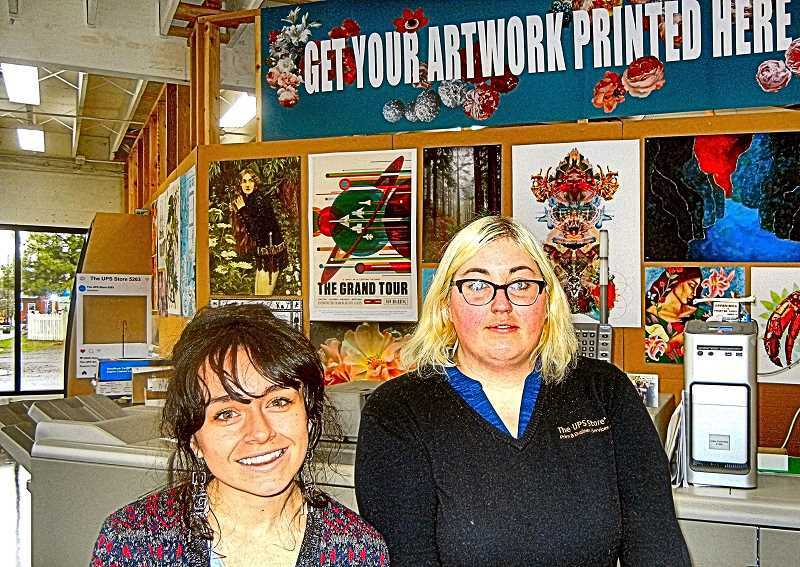 Another printing company in Southeast Portland that is widely known for its high quality work is Minuteman Press in the Brooklyn neighborhood. Over five years ago they moved from S.E. 34th Avenue and Powell Boulevard to 3382 S.E. 20th Avenue, just south of Powell. No matter what your project, any of these printing businesses can turn your ideas or dreams into satisfying finished products.